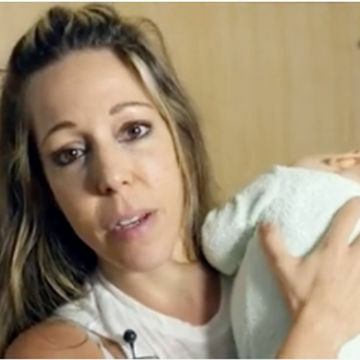 A woman released an incredibly sad video about her decision not to vaccinate herself for whooping cough while she was pregnant. It's a tough watch but a must-see. Cormit Avital was 28 weeks pregnant when she decided not to take a whooping cough vaccination. The Tdap vaccine—which protects against whopping cough, diphtheria and tetanus—is usually given between 27- and 36-weeks pregnant, and it protects babies until their immune systems become strong enough for them to be vaccinated. Avital decided to ignore that recommendation, though. She believed it was "unnecessary." The repercussions of Avital's decisions were devastating. She developed whooping cough, or pertussis, which she was able to fight quickly...but the disease was passed on to her daughter, Eva. Avital certainly learned from her experience, changing her stance on vaccinations during pregnancy. Now she's hoping others will make the choice she wishes she had made. The video was for Australian government organization Gold Coast Health, which works to encourage women to get vaccinated while pregnant. Avital shared her story in the video: Eva has been fighting whooping cough in an intensive care unit. According to Avital, her baby's struggle incredibly hard to witness. "They go red, and then they go blue, and sometimes they go black and you think they are dead in your hands," she said. "They flop. [It's] a lot of suffering for a tiny little thing, that you love so much. It's just so hard to watch...If I could turn back time, I would protect myself."